“Ceremonies without Boundaries” captures my commitment to you to shape your marriage and wedding ceremony according to your desires. Together… we will engage in an inquiry that will identify each of your personal strengths and your collective vision of your marriage. This discovery will lead to our co-creation of a customized ceremony that includes the readings, music, traditions that express your emerging vision as a couple. We will draw from ancient rituals, traditions or contemporary readings and music, or from current and personal writings, and poetry. More often than not couples come from different cultural or spiritual paths, and so their ceremony is designed to express their diverse paths. Your sacred moment can take place in a traditional milieux or in a venues that have special meaning for you. In our lifetime you will experience significant transitions that need to be marked by your values, customs and beliefs. When you publically proclaim your love and commitment for your soulmate it is important to celebrate the full meaning of this sacred moment. Find out what our clients think of our services. 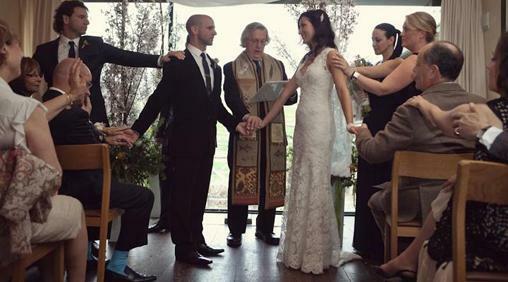 Ceremonies Without Boundaries isn’t just for weddings. We also perfom Child Dedications, Namings, Christenings, Baptisms as well as Memorial Ceremonies. Some copy here leading a reader into this section of the site. An ordained catholic priest, who made a personal choice of conscience to marry and have a family almost four decades ago. © Copyright 2019 Ceremonies Without Boundaries All Rights Reserved.